“In general it is not easy to receive these great empowerments,” he continued. “Some people come to me and want to make a Dharma connection through the Secret Mantra Vajrayana, so they ask for this one. When I give this, however, I am not thinking of other people making a Dharma connection with me, but rather that Chakrasamvara is the main yidam for the Karma Kamtsang, and for all Kagyu lineages actually. He is also one of the five sets of five great deities in the practices from the First Karmapa, Dusum Khyenpa. In conclusion, the Karmapa explained that he will not be giving the complete four empowerments nor that of the vajra master, which makes it easier since there will be no commitments for mantra repetition or other vows. Of course, there will be the bodhisattva vow and some small samaya commitments, but there is no need to worry about the fourteen root downfalls or mantra recitation. The actual empowerment stretched out over three days, one for the land ceremony, another for the preparations, and finally the actual empowerment. In general, the land ceremony requests permission to use the area for bestowing the empowerment. Within our world there are many unseen beings and one type is known as holders of the land. Before an empowerment can be given, it is important to request their permission to have the land for this ceremony and not create obstacles. To that end they are praised and given copious offerings, both actual in the form of tormas and other substances as well as visualized on a vast scale and in shapes that are appealing to them. This ceremony took place on sixth of February in the Monlam Pavilion. In the quiet of morning, monks and nuns stood around in small groups waiting for the Gyalwang Karmapa to arrive. Rays of the early morning sun turned the floor of the Monlam Pavilion into swaths of gold. The stage had been especially prepared for the occasion with the Karmapa’s throne on the east side of a square made up of cushions and tables. In the other three directions there were twenty-four lamas who had just finished three-year retreat plus their retreat master and the young Drupon Rinpoche who sat in the leading position. Placed in the middle of this square is the green colored, square-shaped base for the sand mandala of Chakrasamvara, which will serve as the foundation for the shrine. In the bare mandala’s center is a large white offering torma (sculpture) whose delicately sculpted ornamental flowers in a rainbow of colors face the Karmapa. Behind his throne is placed a screen painted with the kings of the four directions who function as protectors. After the Karmapa arrived and took his seat, the ceremony began. 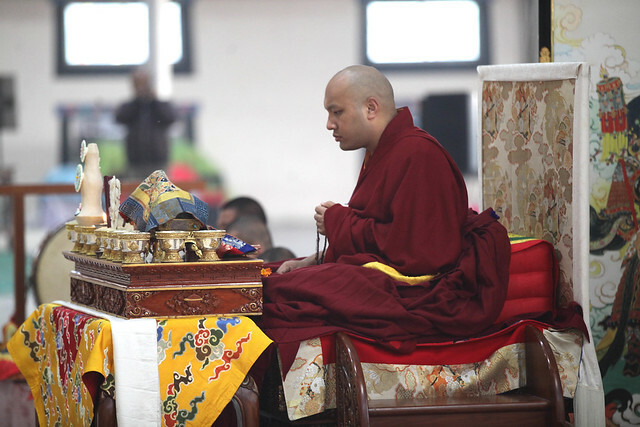 During the ceremony, His Holiness had blessed colored grains ground from precious stones. Once the final offerings were made from the mandala base and the Karmapa had departed, these grains and the mandala base were carried to another room where monks worked in secret for long hours to create the mandala. They mixed the blessed grains with finer ones that are easier to handle, and when the outline was drawn in ink on the basis, they began the process of creating the mandala. This palace of the deity was then brought to the shrine and placed in its center. The golden pavilion with its upturned roof and opened doors was placed over the mandala. Offerings lined the front of the shrine and right behind them were the two vases representing Chakrasamvara and Vajra Varahi. On the far side was arranged a large deity torma and right behind it, a thangka of Chakrasamvara. On the shelves outside in the four directions were placed the substances needed for the preparatory initiation on the following day: kusha grass for dreaming, red cords to prevent obstacles, the multicolored lotus and tooth cleaning sticks to divine what siddhis would come to each person, and water from a white conch shell to purify the participants’ body, speech, and mind. Thus on the first day, everything had been prepared with the utmost care, beauty, and attention to detail so that all would go well for the next two days of ceremonies.